In this photogenic generation, everyone especially all those beautiful girls dreaming of picture perfect smile. And of course, nothing can beat a dazzling smile, because the smile is precious! Many of the people won’t share their picture on social media because of their dull smile. And more surprising factor is, smile with ‘Showing Teeth’ has more likability and influence on others – according to ‘Photofeeler’. Then Dental Veneers is just for you to improve your smile. Before you get ready for Veneers, you’ll, of course, have many questions in mind. So, here is the answer for all your questions. A “veneer “is a thin, semi translucent layer of material that is bonded to the surface of the tooth to correct a chipped, cracked or broken tooth or to change a color and shape of the tooth to enhance the appearance. Porcelain Veneers are made up of thin pieces of porcelain that help to redesign the smile changing shape, size and color of the tooth. It also provides strength and resilience comparable to natural tooth enamel. In the first step, the dentist will take an impression of your teeth to create your match of veneers. 2nd step is the removal of the tooth surface, about 1/2mm of enamel. It is an equal amount of the thickness of veneers. And then final veneers is given to you. It is an excellent choice for stain teeth, fractured teeth, gaps between teeth and minor correction in an alignment of teeth. Porcelain material offers strong bond between teeth and veneer and enhances the success of veneers. The durability of porcelain veneers is also high along with creating natural tooth appearance. It also resists stains! Composite veneers are made up of engineered Resin material (Tooth colored filling material). Minute teeth reduction is required to correct any discrepancy and to create space for the composite resin and thus it can be easily fixed in one visit after the initial consultation. It represents a less expensive alternative option over the porcelain veneers. It cost half of what porcelain veneers do. One of the advantages of this is – it could be removed and replaced easily. The durability of this kind of Veneer is four to eight years but compare to Porcelain type, it is lesser. This type of veneer easily gets stained – not advisable for people who are addicted to Coffee and red wine. It also requires more maintenance in order to keep it long lasting. Lumineers are contact-lens-thin porcelain veneers that are bonded to the front surfaces of teeth. Lumineers require no reduction in tooth structure. Because of that, there is some limitation of lumineers over the porcelain veneer. Is the veneer an alternative for dental braces? Not always. Your dentist will advise you that which is the best option for you to correct alignment of teeth. If you don’t have severe deformity then veneer will reshape your teeth without braces. 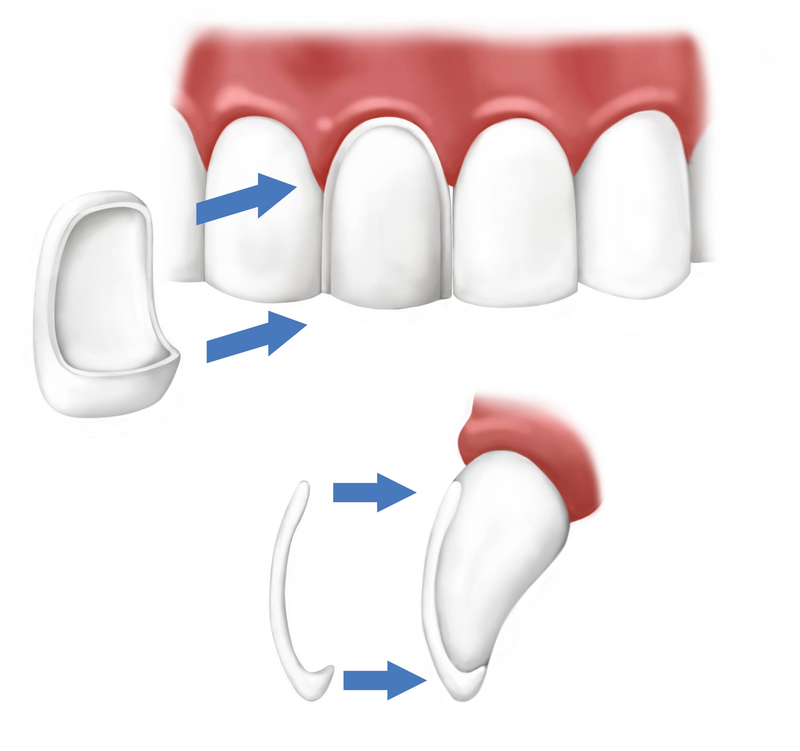 Thickness varies depending on types of dental veneers. It varies from 0.5 mm to 1 mm. No one can make out the difference from natural teeth! What is the average life of veneers? How many sitting is required to get veneers? Total 2 to 3 sitting is required for veneer placement after the initial consultation. How to take care of dental veneers? Dental veneer can last longer if the patient will take good oral care at home. Routine Dentist visit in every 6 months for regular checkup and cleanings. You need to change some oral habits like nail biting, opening bobby pins and chewing on hard objects which can damage the dental veneers. 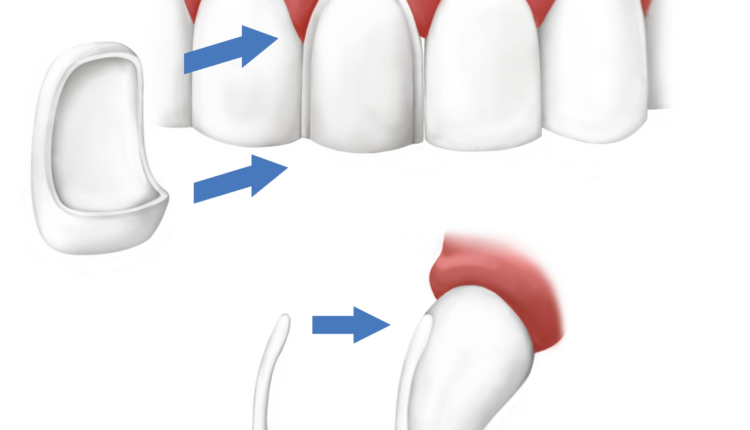 Is dental veneer a reversible procedure? If lumineers is used to correct the alignment of teeth without any alteration in teeth surface, you can get back your original teeth but not possible with porcelain veneers. To find out more about dental veneers treatment and to discuss your cosmetic problem contact US Dental – Cosmetic Dentistry specialist for dental veneers treatment in Ahmedabad and to accomplish complete smile makeover!